Can Wedding Planning be Easy? If you’ve ever been involved in planning a wedding, here’s a simple equation I’m sure you’re familiar with: wedding planning = stress2. As I’m writing this, Brett and I are due to tie the knot in less than 4 months, 115 days to be precise. In contrast to this, everything I’m reading – all my wedding organizers and checklists – state that a wedding photographer should be chosen shortly after the engagement or 6-12 months before the wedding. Uh-oh. Fortunately for you, I’ve spent many hours researching what should be considered when deciding on a wedding photographer. Unfortunately for me, perhaps some of those hours should have been spent actually hiring a photographer. So, while I sit here breathing heavily into a paper bag praying to the wedding planning gods that there are still decent photographers available for our wedding, hopefully you’ll be reading this long before your special day. Ask Around. The perfect way to begin your hunt is to ask around. Speaking to recently married friends, family, co-workers or even members of wedding forums can be a huge help. Ask them if they were happy with their photographer and if you can look at their wedding album. You get what you pay for. 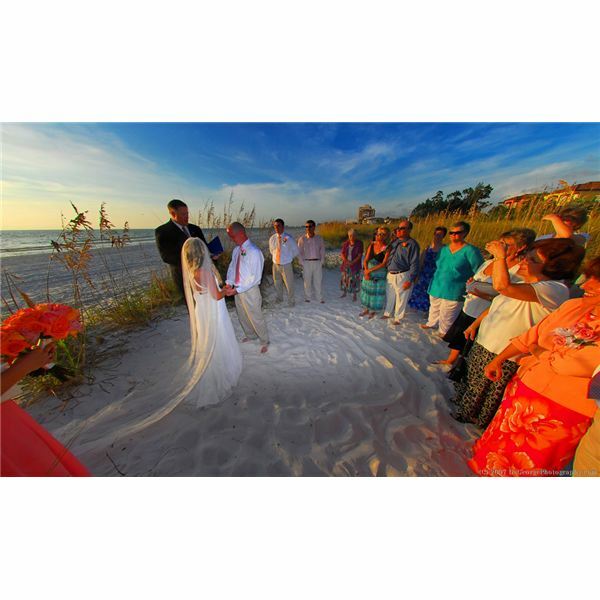 Your wedding photographs are probably the most important keepsakes from your wedding, they will be cherished and most likely passed down generation to generation. In all probability, hiring a photographer that offers their services at a bargain basement price will undoubtedly produce bargain basement results. That’s not to say you should spend your entire budget on your photographer or that finding good deals will result in horrible photos, it simply means that you probably shouldn’t use the cheapest photographer available. Make a checklist of important poses. I don’t think we’re going to hire a pro for the entire length of our wedding. I think we’ll have a professional photographer shoot the ceremony, formal pictures, and the beginning of our reception and leave the rest to family, friends and cheap disposable cameras on the tables. I want to be sure our wedding photographer gets the shots we want. Providing your photographer with a checklist of important shots can help them understand what’s important to you. Keep in mind your list should only be a guide – you should be confident enough in your photographer’s capabilities anyway and if they have a strict list to follow they won’t have time to show their creativity. VIP list. Offer your photographer a list and description of the people you definitely don’t want them to miss. This can easily be accomplished by simply providing them with a seating chart. Checklist. Country Weddings has a great printable checklist. It provides you with a spot to check off the important poses as well as a place for additional notes. There are several questions you should ask prospective wedding photographers. Part two of this article will focus on just that.